Home Companies Xiamen Fangcheng Electronic Science And Technology Co., Ltd.
A pH meter is a precise voltmeter that measures the potential difference, in thousandths of a volt (mV), between the reference electrode and the measuring pH electrode. It's scaled in such a way that it displays not the measured potential, but converts it to a display of pH. According to Nernst equation a standard pH electrode generates a voltage of about 59 mV per pH, and at pH 7 (neutral pH) the electrode produces 0 volts. Acids produce positive and bases negative voltages. Though there are many types of pH meters, common varieties will come with calibration liquids called buffer solutions. These solutions are predetermined to be highly acidic (4.01), neutral (7.01), and alkaline or base (10.01). Calibration is accomplished by testing the liquids with the probe and adjusting the meter’s readings. A pH meter should be recalibrated monthly for best results. When not in use, the tip of the probe must be stored in acidic solution. If the probe dries out, it will need replacement. Water quality controllers commonly use pH meters. Other types of meters test solids like soil or even foods. Many aquarists use pH meters in lieu of liquid testing. The probe can be placed permanently in an aquarium sump and the meter, mounted inside the aquarium stand or on a nearby wall. Freshwater cichlids and saltwater fish require alkaline water, while African Nile fish thrive in acidic freshwater. In an aquarium, pH fluctuation can cause illness or death to fish, so monitoring pH closely is paramount. There are three different types of pH meters: portable, bench and in-line. • Portable devices are great when you need to perform measurements outside the laboratory. 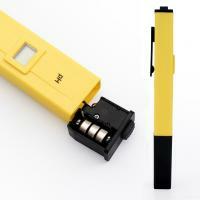 Portable pH tester should be ergonomic, rugged and versatile. • Bench tester is usually more precise and has more options. They are typically used in a laboratory where an interface for data communication and advance measurement features are important. • In-line pH transmitters for process control are designed to with stand harsh environments. A pH tester needs to be calibrated in order to correct for any deviation of the electrodes from their ideal behavior. A: Generally, we pack our goods in neutral PP boxes and brown cartons. If you have legally registered patent, we can pack the goods in your branded boxes after getting your authorization letters. A: Generally, it will take 3 to 30 days after receiving your advance payment. The specific delivery time depends on the items and the quantity of your order. A: We can supply the sample if we have ready parts in stock, and requirethat you my friends, pay the sample cost and the courier cost.